National Teacher Appreciation Week is just a few weeks away (May 6th through 10th) and we're on the hunt for some creative and clever ways to show the educators in your life how truly special they are. It's hard to find another profession that is as demanding and rewarding as that of an teacher. Take time to recognize and celebrate their hard work! 1. School themed cookies Whether they come from your kitchen or a local bakery, a sweet school themed treat always hits the spot. 2. Adorable drink sleeves These perfect penmanship drink sleeves will keep your teacher's coffee warm and cozy. 3. Chalkboard Picture frame What a great way to display her favorite class picture for years to come. 4. Handmade lunchbags A packed lunch is part of the job description, so why not send her to school in style. 5. FREE Bag Toppers A fine finishing touch for your favorite gift. 6. Apple cookies Can't go wrong with an apple for the teacher (a cookie one is even better), especially packaged in mason jars! 7. Letter initial made from crayons A personalized craft that even the youngest of students can help create. 8. School supply cake We've seen diaper cakes, but why not shower your teacher with a slew of supplies. 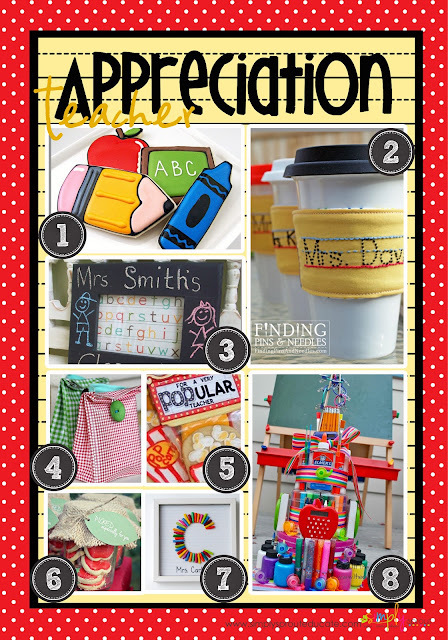 Check out our PINTEREST for more Teacher Appreciation ideas! Find more adorable Teacher Appreciation gift tags to make your gift extra special!